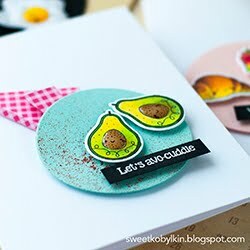 Today I am sharing my first cards made with NUVO Glimmer Pastes by Tonic Studios. These pastes have been on my Wish List in August and now they made their way to my craft stash just right before the Holiday Season. To start with I have chosen two shades - Moonstone and Golden Crystal. Сегодня я показываю свои первые работы с использованием паст NUVO Glimmer от английской компании Tonic Studios. Я уже с августа мечтала попробовать эти пасты, и наконец я их получила. Мой выбор пал на оттенки Moonstone и Golden Crystal. 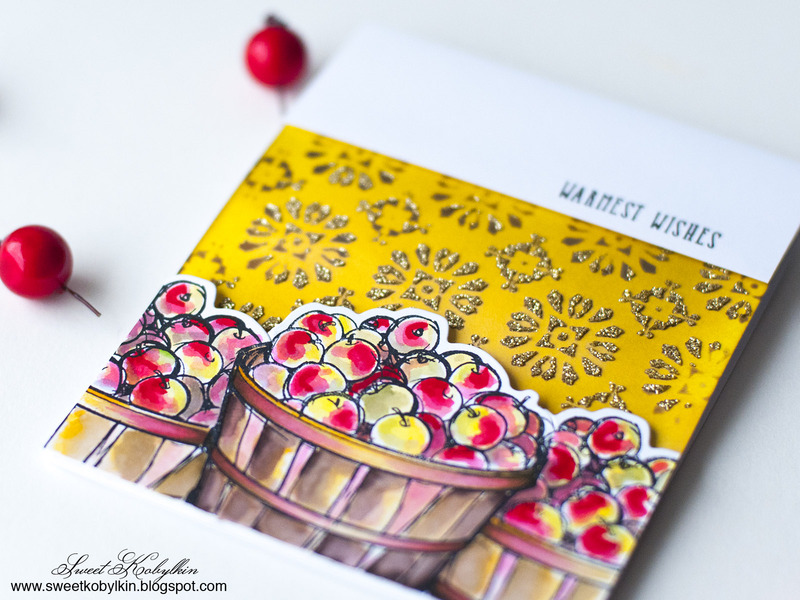 For this card I used Golden Crystal Glimmer Paste and Tim Holtz Layering Stencil Rosette. 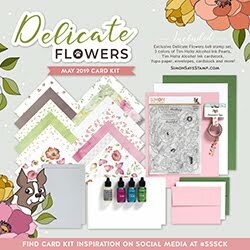 Для этой открытки я использовала пасту Golden Crystal Glimmer и трафарет Tim Holtz Layering Stencil Rosette. I stamped apples from Be Thankful set by STAMPlorations, die cut them using the matching die and coloured with ZIG markers. Then blended Distress inks to a card panel, covered it with the stencil, applied a darker shade of Distress ink and the Glimmer Paste. Сначала на полоске из кардстока сделала три оттиска яблок из набора штампов Be Thankful от американской компании STAMPlorations, с помощью парного ножа сделала вырубку по верхнему краю и раскрасила оттиски маркерами ZIG. Затонировала панель из кардстока чернилами Distress и через трафарет нанесла более темный оттенок чернил Distress и пасту. For the second card I used Moonstone Glimmer Paste and one of my all time favourite stencils - Falling Snow by Simon Says Stamp. Для второй открытки я взяла пасту оттенка Moonstone и свой самый любимый трафарет от Simon Says Stamp - Falling Snow. I stamped the image in black archival ink, coloured the impression with ZIG markers. Then did myself a mask from paper, covered the image, masked off the bottom of the card panel with washi tape, blended Distress inks and applied Moonstone Glimmer Paste through the stencil. Оттиск сделан архивными чернилами и раскрашен маркерами ZIG. Из бумаги Inkadinkado я сама сделала маску и закрыла изображение, а низ панели - бумажным скотчем. Затонировала панель и нанесла пасту Moonstone Glimmer через трафарет. 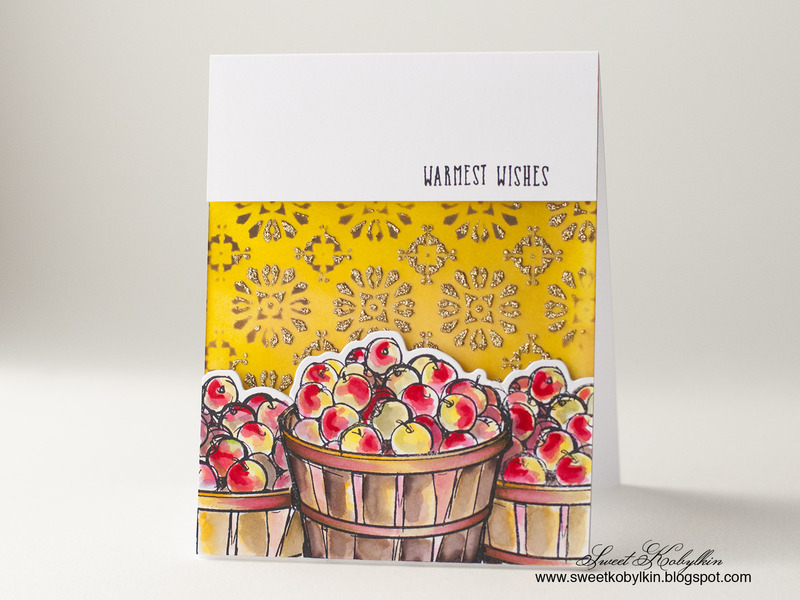 The third card is similar, but I used Golden Crystal Paste and Falling Stars Stencil by Simon Says Stamp. И последняя открытка, по сути такая же как и вторая, но с использованием пасты Golden Crystal и трафарета Falling Stars от Simon Says Stamp. 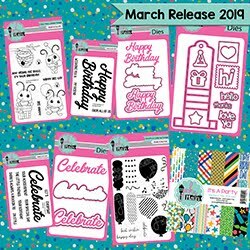 I am giving away a new set of stamps Birthday, Baby! 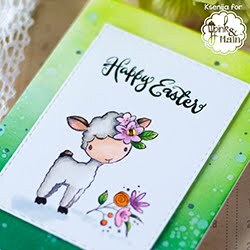 by Penny Black. Isn't it cute? On September 24, I will randomly chose a winner from those who answer to my question: What new supplies have you tried recently? Tell me your experience in the comments bellow. Open Internationally. Я разыгрываю новый набор штампов Birthday, Baby! 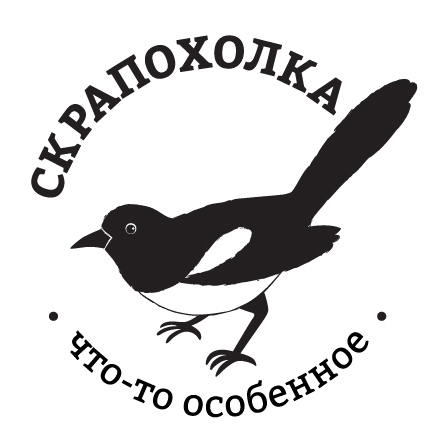 от Penny Black. 24 сентября я методом тык выберу счастливчика среди тех, кто ответит на мой вопрос в комментариях к этой публикации: А что вы пробовали из новинок в последнее время? Что вам понравилось или нет? Спасибо, что заскочили. Желаю всем прекрасного дня! Ksenija you can't know how many wish lists I've made with this Glimmer paste on it!!! 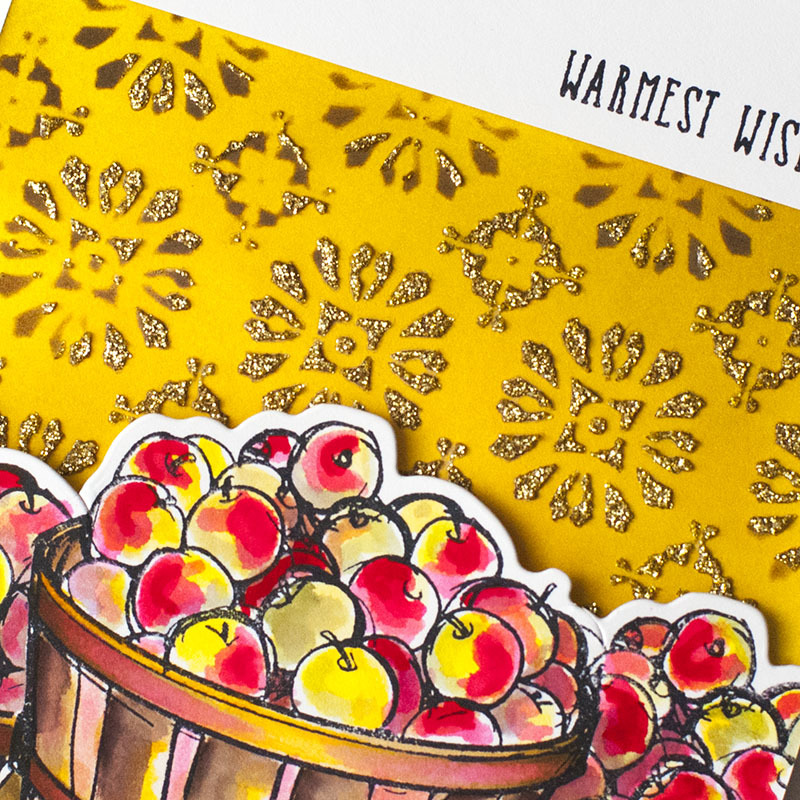 LOve your gorgeous, glimmering, adorable cards! Your apples are so beautiful! I JUST inked up my second ever Penny Black stamp [will be on my blog in October] I would LOVE to win this darling little baby - oh, that font! thank you for your generous heart! Интересно! А на что их фольга клеится? Какая там технология? WOW! Your cards, to showcase the glimmer paste, are absolutely stunning! Your apples are delicious enough to eat (thoughts of apple pie and apple muffins, fresh from the oven, will be my mind today!). 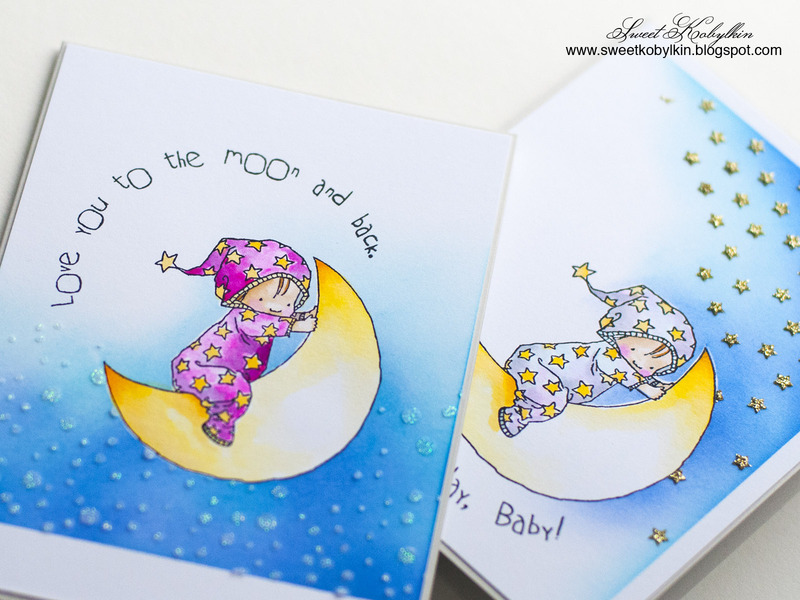 The little ones on the moon cards...oh my! So precious! "Love you to the moon and back" is something I always say to my niece and nephew, so that sentiment touches my heart. 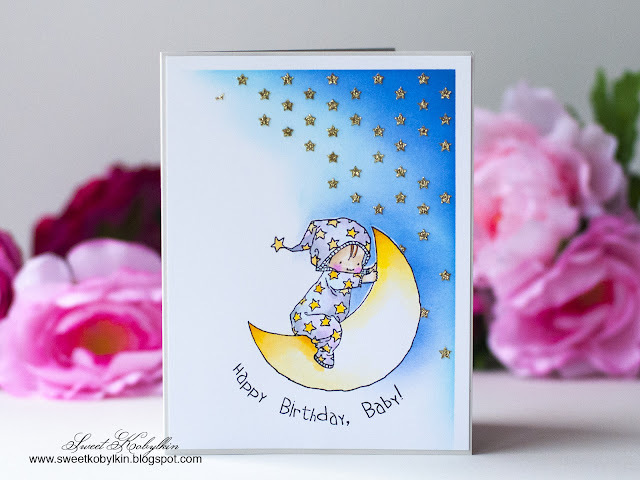 The baby birthday card: pure delight! All three of these are frame worthy, deserving to be showcased as pieces of home decor by those fortunate enough to receive them! My 'newest' supplies that I'm trying: prismacolour pencils. I've signed up for colouring classes with Kit and Clowder. The lessons are fabulous (although I'm already a bit behind in my 'assignments' because I need everything to be 'perfect' *grin*). 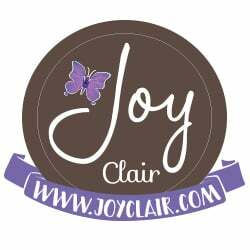 Thank you for your generous giveaway and, especially, for sharing your gifts of creativity with us! Stunning cards ! 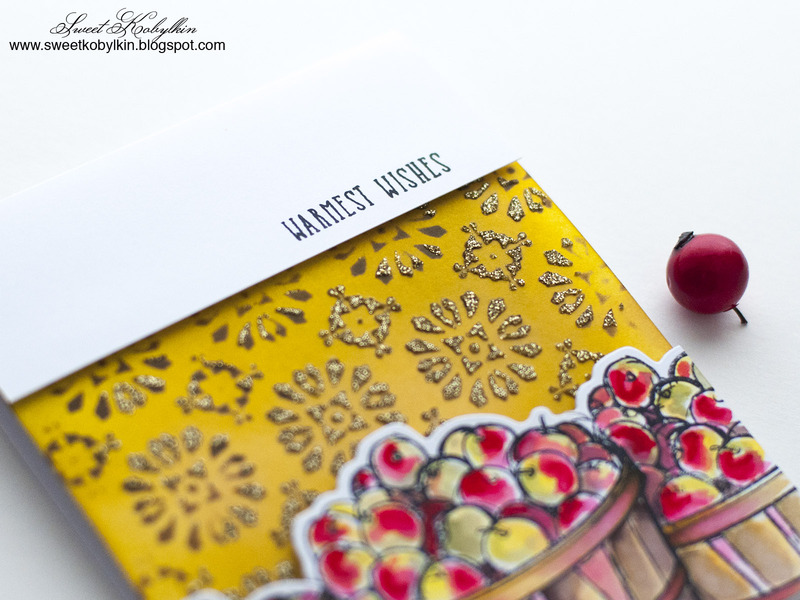 These glimmer pastes look so gorgeous on your blended backgrounds ! I love your very detailed explanation about them. 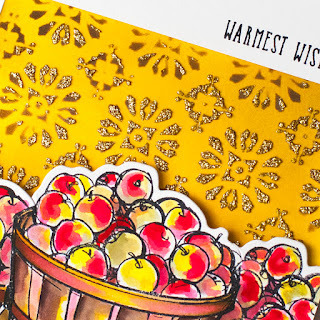 Love your beautiful card with the barrels of apples, so yummy with these fall colours. And the two baby cards are so adorable. 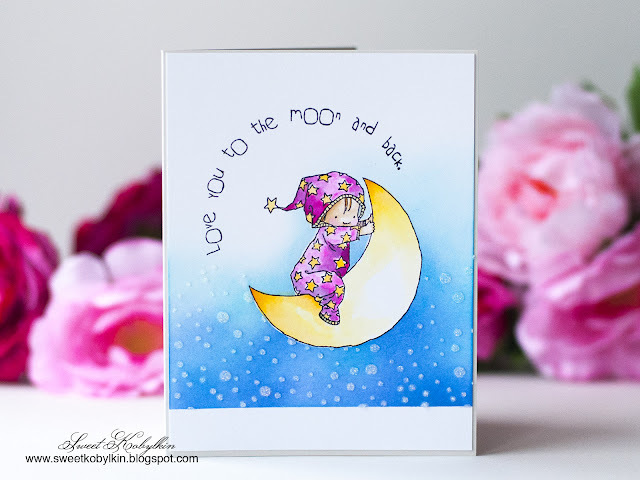 Love this so famous sentiment "love you to the moon and back", I cannot remember how many times my children asked me to read them the story ! My newest supply are Nuvo Christal drops : I'm not yet really good using them. I find it difficult to make a perfect cambered round drop. I even had the bad surprise to see the colour changing by laying it down on black dye ink ! But I love the colours they have. And about ZIGs, they are on my wish list for Santa ! 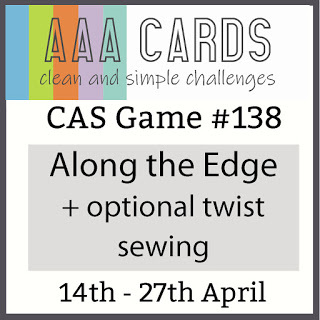 Thank you for sharing all your beautiful cards, for the great explanation and for the chance to win !